Austria (German: Österreich, Czech: Rakousko, Slovenian: Avstrija; Croatian: Austrija; Serbian: Aустрија; Hungarian: Ausztria; see also other languages) is a landlocked country in Central Europe. It borders Germany and the Czech Republic to the north, Slovakia and Hungary to the east, Slovenia and Italy to the south, and Switzerland and Liechtenstein to the west. Its capital city is Vienna. Austria is a parliamentary representative democracy consisting of nine federal states and is one of six European countries that have declared permanent neutrality and one of the few countries that included the concept of everlasting neutrality in their constitution. Austria is a member of the United Nations since 1955 and joined the European Union in 1995. The German name Österreich can be translated into English as the "eastern realm", which is derived from the Old German Ostarrîchi. The name was Latinized as "Austria", so it has no etymological connection with the name of Australia (which correctly means The South). Reich can also mean "empire", and this connotation is the one that is understood in the context of the Austrian/ Austro-Hungarian Empire, Holy Roman Empire, although not in the context of the modern Republic of Österreich. The term probably originates in a vernacular translation of the Medieval Latin name for the region: Marchia orientalis, which translates as "eastern borderland", as it was situated at the eastern edge of the Holy Roman Empire, that was also mirrored in the name Ostmark, for a short period applied after Anschluss to Germany. During the monarchy, Austria was known as the Austrian Empire (Kaisertum Österreich), however no official designation existed since the empire was strongly multiethnic. After the Ausgleich with Hungary in 1867, the empire became known as Austria-Hungary in reflection of the dual monarchy character. Some historians argue that the term The Kingdoms and Lands Represented in the Imperial Council and the Lands of the Crown of St. Stephen (Die im Reichsrat vertretenen Königreiche und Länder und die Länder der heiligen ungarischen Stephanskrone) was the correct official name for Austria-Hungary. The territory of Austria, originally known as the Celtic kingdom of Noricum, was a long time ally of Rome. It was occupied rather than conquered by the Romans during the reign of Augustus and made the province Noricum in 16 BC. Later it was conquered by Huns, Rugii, Lombards, Ostrogoths, Slavs, Bavarii, Avars (until c. 800), and Franks (in that order). Finally, after 48 years of Hungarian rule (907 to 955), the core territory of Austria was awarded to Leopold of Babenberg in 976 after the revolt of Henry II, Duke of Bavaria. Being part of the Holy Roman Empire the Babenbergs ruled and expanded Austria from the 10th century to the 13th century. After Frederick II, Duke of Austria died in 1246 and left no successor, Rudolf I of Habsburg gave the lands to his sons marking the beginning of the line of the Habsburgs, who continued to govern Austria until the 20th century. With the short exception of Charles VII Albert of Bavaria, Austrian Habsburgs held the position of German Emperor beginning in 1438 with Albert II of Habsburg until the end of the Holy Roman Empire. During the 14th and 15th century Austria continued to expand its territory until it reached the position of a European imperial power at the end of the 15th century. Under Maximilian I (Holy Roman Emperor) and his son ( Philip the Handsome - he died before his father in 1506 a.c.) the Austrian Empire reached its greatest expansion, including Spain (through marriage) and all its territories in the "new world". Maximilian II was one of the older brothers of Maria Antonia Josefa Johanna von Habsburg-Lothringen, Archduchess of Austria from her birth in 1755 to her marriage in 1768. At this time, she became not Maria Antonia, but Marie Antoinette, Dauphine of France. She cemented the Austria-France alliance when she married the heir apparent and grandson of King Louis XV of France. She later became Queen when the king died of smallpox. Just two years before the abolition of the Holy Roman Empire in 1806, in 1804 the Empire of Austria was founded, which was transformed in 1867 into the dual-monarchy Austria-Hungary. The empire was split into several independent states in 1918, after the defeat of the Central Powers in World War I, with most of the German-speaking parts becoming a republic. (See Treaty of Saint-Germain.) Between 1918 and 1919 it was officially known as the Republic of German Austria (Republik Deutschösterreich). After the Entente powers forbade German Austria to unite with Germany, they also forbade the name, and then it was changed to simply Republic of Austria. This democratic republic, the First Austrian Republic, lasted until 1933 when the chancellor Engelbert Dollfuß established an autocratic regime oriented towards Italian fascism ( Austrofascism). Austria became part of Germany in 1938 through the Anschluss and remained under Nazi rule until the end of World War II. After the defeat of the Axis Powers, the Allies occupied Austria until 1955, when the country became a fully independent republic under the condition that it would remain neutral in the growing conflict between the Communist Eastern Bloc and the non-Communist West (see: Austrian State Treaty). Austria also became a member of the UN in the same year. After the collapse of communist states in Eastern Europe, Austria became increasingly involved in European affairs, in 1995 joining the European Union, and in 1999 adopting the Euro monetary system. Austria became a federal, parliamentarian, democratic republic through the Federal Constitution of 1920. It was reintroduced in 1945 to the nine states of the Federal Republic. The head of state is the Federal President, who is directly elected. The chairman of the Federal Government is the Federal Chancellor, who is appointed by the president. The government can be removed from office by either a presidential decree or by vote of no confidence in the lower chamber of parliament, the Nationalrat. The Parliament of Austria consists of two chambers. The composition of the Nationalrat is determined every four years by a free general election in which every citizen is allowed to vote to fill its 183 seats. A "Four Percent Hurdle" prevents a large splintering of the political landscape in the Nationalrat by awarding seats only to political parties that have obtained at least a four percent threshold of the general vote, or alternatively, have won a direct seat, or Direktmandat, in one of the 43 regional election districts. The Nationalrat is the dominant chamber in the formation of legislation in Austria. However, the upper house of parliament, the Bundesrat has a limited right of veto (the Nationalrat can — in most cases — pass the respective bill a second time bypassing the Bundesrat altogether). A convention, called the Österreich–Konvent was convened in June 30, 2003 to decide upon suggestions to reform the constitution, but has failed to produce a proposal that would receive the two thirds of votes in the Nationalrat necessary for constitutional amendments and/or reform. However, some important parts of the final report were generally agreed upon and are still expected to be implemented. 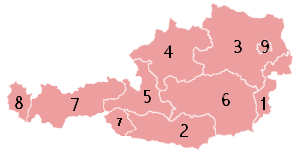 A federal republic, Austria is divided into nine states, (German: Bundesländer). These states are divided into districts ( Bezirke) and cities ( Statutarstädte). Districts are subdivided into municipalities (Gemeinden). Cities have the competencies otherwise granted to both districts and municipalities. The states are not mere administrative divisions, but have some distinct legislative authority separate from the federal government. Austria is a largely mountainous country due to its location in the Alps. The Central Eastern Alps, Northern Limestone Alps and Southern Limestone Alps are all partly in Austria. Of the total area of Austria (84 000 km² or 32,000 sq. mi), only about a quarter can be considered low lying, and only 32% of the country is below 500 metres (1,640 ft). The high mountainous Alps in the west of Austria flatten somewhat into low lands and plains in the east of the country. Austria may be divided into 5 different areas. The biggest area are the Austrian Alps, which constitute 62% of Austria's total area. 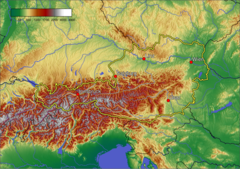 The Austrian foothills at the base of the Alps and the Carpathians account for around 12% of its area. The foothills in the east and areas surrounding the periphery of the Pannoni low country amount to about 12% of the total landmass. The second greater mountain area (much lower than the Alps) is situated in the north. Known as the Austrian granite plateau, it is located in the central area of the Bohemian Mass, and accounts for 10% of Austria. The Austrian portion of the Viennese basin comprises the remaining 4%. The greater part of Austria lies in the cool/temperate climate zone in which humid westerly winds predominate. With over half of the country dominated by the Alps the alpine climate is the predominant one. In the East, in the Pannonian Plain and along the Danube valley, the climate shows continental features with less rain than the alpine areas. Austria has a well-developed social market economy and a high standard of living. Until the 1980s many of Austria's largest industry firms were nationalised, however in recent years privatisation has reduced state holdings to a level comparable to other European economies. Labour movements are particularly strong in Austria and have large influence on labour politics. Germany has historically been the main trading partner of Austria, making it vulnerable to rapid changes in the German economy. Slow growth in Germany and elsewhere in the world affected Austria, slowing its growth to 0.8% in 2001. But since Austria became a member state of the European Union it has gained closer ties to other European Union economies, reducing its economic dependence on Germany. In addition, membership in the EU has drawn an influx of foreign investors attracted by Austria's access to the single European market and proximity to EU aspiring economies. Therefore estimates of growth in 2006 (about 3%) are much more favourable than in the crippling German economy. 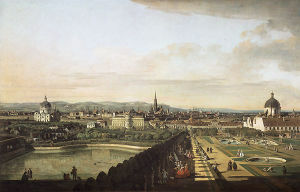 Vienna during the first half of the 18th century, painting by Canaletto. Austria's population was estimated in October, 2006 as 8,292,322 persons. 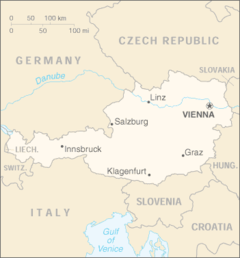 The population of the capital, Vienna, exceeds 1.6 million (2.2 million with suburbs), representing about a quarter of the country's population, and is said to constitute a melting pot of citizens from all over Central and Eastern Europe. In contrast to the capital, other cities do not exceed 1 million inhabitants: the second largest city Graz is home of 240,278 people, followed by Linz with 187,112, Salzburg with 146,868, and Innsbruck with 115,498. All other cities have fewer than 100,000 inhabitants. German-speaking Austrians, by far the country's largest group, form roughly 90% of Austria's population. The Austrian federal states of Carinthia and Styria are home to a significant (indigenous) Slovenian minority with around 14,000 members (Austrian census; unofficial numbers of Slovene groups speak of about 40,000). Around 20,000 Hungarians and 30,000 Croatians live in the east-most Bundesland, Burgenland (formerly part of the hungarian half of Austria-Hungary). The remaining number of Austria's people are of non-Austrian descent, many from surrounding countries, especially from the former East Bloc nations. So-called guest workers (Gastarbeiter) and their descendants, as well as refugees from Yugoslav wars and other conflicts, also form an important minority group in Austria. According to the 2001 census, the mother tongue of the population by prevalence, is German (88.6%) followed by Turkish (2.3%), Serbian (2.2%), Croatian (1.6%), Hungarian (0.5%) and Bosnian (0.4%). The official language, German, is spoken by almost all residents of the country. Austria's mountainous terrain led to the development of many distinct German dialects. All of the dialects in the country, however, belong to Austro-Bavarian groups of German dialects, with the exception of the dialect spoken in its west-most Bundesland, Vorarlberg, which belongs to the group of Alemannic dialects. There is also a distinct grammatical standard for Austrian German with a few differences to the German spoken in Germany. As of 2006 some of the Austrian states introduced standardised tests for new citizens, to assure their languge and cultural knowledge and accordingly their ability to integrate into the Austrian society. An estimated 25,000–40,000 Slovenians in the Austrian state of Carinthia as well as Croatians and Hungarians in Burgenland were recognized as a minority and have enjoyed special rights following the Austrian State Treaty (Staatsvertrag) of 1955. The Slovenians in the Austrian state of Styria (estimated at a number between 1,600 and 5,000) are not recognized as a minority and do not enjoy special rights, although the State Treaty of July 27, 1955 states otherwise. The right for bilingual topographic signs for the regions where Slovene- and Croat-Austrians live alongside the Germanic population (as required by the 1955 State Treaty) is still to be fully implemented. Many Carinthians are afraid of Slovenian territorial claims, pointing to the fact that Yugoslav troops entered the state after each of the two World Wars and considering that some official Slovenian atlases still show parts of Carinthia as Slovenian cultural territory. The current governor, Jörg Haider, has made this fact a matter of public argument in autumn 2005 by refusing to increase the number of bilingual topographic signs in Carinthia. A poll by the Kärntner Humaninstitut conducted in January 2006 states that 65% of Carinthians are not in favour of an increase of bilingual topographic signs, since the original requirements set by the State Treaty of 1955 have already been fulfilled according to their point of view. Another interesting phenomenon is the so called "Windischen-Theorie" stating that the Slovenians can be split in two groups: actual Slovenians and Windische, based on differences in language between Austrian Slovenians, who were taught Slovenian standard language in school and those Slovenians who spoke their local Slovenian dialect but went to German schools. To the latter group the term "Windische" (originally the German word for Slovenians) was applied, claiming that they were a different ethnic group. This theory was never generally accepted and has been ultimately rejected several decades ago. 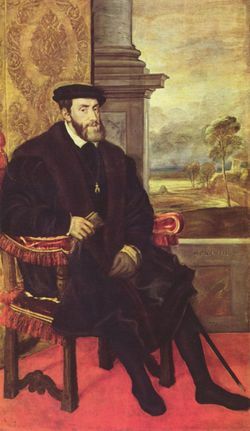 Charles V, Holy Roman Emperor Austrian Habsburg ruler and one of the major figures within the Counter-Reformation. While northern and central Germany was the origin of the Reformation, Austria (and Bavaria) was the heart of the Counter-Reformation in the 16th and 17th century, when the absolute monarchy of Habsburg imposed a strict regime to maintain Catholicism's power and influence among Austrians. The Habsburgs viewed themselves as the vanguard of Roman Catholicism and all other confessions and religions were oppressed. In 1781 Emperor Joseph II issued a Patent of Tolerance that allowed other Christian confessions a limited freedom of worship. Religious freedom was declared a constitutional right in the Austro-Hungarian Ausgleich in 1867 thus paying tribute to the fact that the monarchy was home of numerous religions beside Roman Catholicism such as Greek, Serbian, Romanian, Russian, and Bulgarian Orthodox Christians, Jews, Muslims (Austria neighboured the Ottoman empire for centuries), Mormons and both Calvinist and Lutheran Protestants. Still Austria remained largely influenced by Catholicism. After 1918 First Republic Catholic leaders such as Theodor Innitzer and Ignaz Seipel took leading positions within or close to the Austrian Government and increased their influence during the time of the Austrofascism—Catholicism was treated much like a state religion by dictators Engelbert Dollfuss and Kurt Schuschnigg. Although Catholic leaders welcomed the Germans in 1938 during the Anschluss of Austria into Germany, Austrian Catholicism stopped its support of Nazism later on and many former religious public figures became involved with the resistance during the Third Reich. After 1945 a stricter secularism was imposed in Austria and religious influence on politics has nearly vanished. As of the end of the twentieth century about 73% of Austria's population were registered as Roman Catholic, while about 5% considered themselves Protestants. Both these numbers have been on the decline for decades, especially Roman Catholicism, which has suffered an increasing number of seceders of the church. Austrian Catholics are obliged to pay a mandatory tax (calculated by income—ca. 1%) to the Austrian Roman Catholic Church, which might act as an incentive to leave the church. About 12% of the population declare that they do not belong to any church or religious community. Of the remaining people, about 180,000 are members of the Eastern Orthodox Church and about 7,300 are Jewish. It has to be noted that the Austrian Jewish Community of 1938 – Vienna alone counted more than 200,000 - was reduced to solely 4,000 to 5,000 after the Second World War. The influx of Eastern Europeans, especially from the former Yugoslav nations, Albania and particularly from Turkey largely contributed to a substantial Muslim minority in Austria—around 300,000 are registered as members of various Muslim communities. The numbers of people adhering to the Islam has increased largely during the last years and is expected to grow in the future. Buddhism, which was legally recognized as a religion in Austria in 1983, enjoys widespread acceptance and has a following of 20,000 (10,402 at the 2001 census). A 2005 survey among 8,000 people in various European countries showed that Austria is among those nations whose populations maintain the strongest belief in God. 84% of all Austrians state a belief in God, with only the people of Poland (97%), Portugal (90%) and Russia (87%) yielding higher numbers. This is a much larger figure than the European average of 71% or Germany with 67%. Complementing its status as a land of artists, Austria has always been a country of poets, writers and novelists. It was the home of novelists Arthur Schnitzler, Stefan Zweig, Thomas Bernhard or Robert Musil, of poets Georg Trakl, Franz Werfel, Franz Grillparzer, Rainer Maria Rilke or Adalbert Stifter and writer Karl Kraus. Famous contemporary playwrights and novelists are Elfriede Jelinek and Peter Handke. Among Austrian artists and architects one can find painters Gustav Klimt, Oskar Kokoschka, Egon Schiele or Friedensreich Hundertwasser, photographer Inge Morath or architect Otto Wagner. Austria was the cradle of numerous scientists including physicists Ludwig Boltzmann, Lise Meitner, Erwin Schrödinger, Ernst Mach, Wolfgang Pauli, Richard von Mises and Christian Doppler, philosophers Ludwig Wittgenstein and Karl Popper, biologists Gregor Mendel and Konrad Lorenz as well as mathematician Kurt Gödel. It was home to psychologists Sigmund Freud, Alfred Adler, Paul Watzlawick and Hans Asperger, psychiatrist Viktor Frankl, economists Joseph Schumpeter, Eugen von Böhm-Bawerk, Ludwig von Mises, and Friedrich Hayek ( Austrian School) and Peter Drucker, and engineers such as Ferdinand Porsche and Siegfried Marcus. Austria and Canada have shared a strong relationship, and of course grudge hockey matches, for some time. This was mainly due to the work of Frank Stronach. Magna Auto Parts sponsors students to work in Canada, and vice versa in Austria. Belinda Stronach was once quoted as saying, "I'm Canadian, my father is Austrian, that makes me the luckiest person in the world."